Wearables are known as consumer technologies, but the applications for business could be just as useful. Take this RoboCop-style hat. 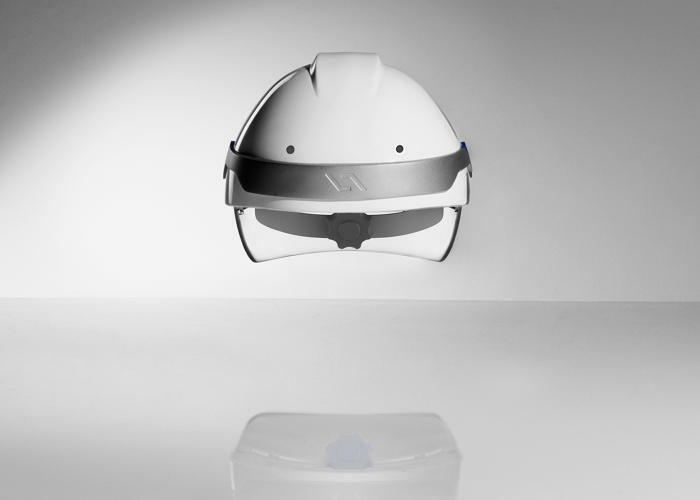 Developed by DAQRI in Los Angeles, the Smart Helmet combines cameras, sensors for things like object mapping and thermal imaging, and recording devices for video and audio. It's basically an onboard computer that recognizes signs, reads meters and automatically makes a 3-D version of the environment that workers are moving through. "A lot of the glasses that are on the market now are designed to be more or less cellphones that you wear on your face, not an industrial human-machine interface," says Andy Lowery, DAQRI's president. "You're able not to overlay a digital interface on an environment in the same way." DAQRI is launching the helmet product early next year, starting with an app that reads gauges—say, pressure gauges in a brewery or oil refinery. "It takes completely offline devices that have no current ability to be automated, logs data manually, and transmits it back to a database where it's registered," Lowery says. The helmet doesn't come cheap. DAQRI won't reveal a final price, but it's likely to be in the $5,000-$10,000 range (probably at the upper end). Lowery says that's the equivalent of an expensive ruggedized laptop. Which may be stretching it. But then a laptop can't do things thermal imaging and highly accurate measuring. The helmet, which is controlled either from an Android smart watch or with half a dozen gestures, could allow workers to find heat leaks in factories and enable construction workers to look up designs to see where they should be drilling holes and placing rivets. Shifting between 2-D drawings and real life is often time-consuming, requiring specialist on-hand meteorologists. While some of the reasons to use Google Glass and the like look flimsy and pointless, the applications for the DAQRI helmet at least look practical. For those who can afford it, anyway.